Can you wash a baby’s face with soap? « Howard J. Bennett - Pediatrician and Author in Washington, D.C.
Can you wash a baby’s face with soap? Many childrearing books tell you not to use soap on a baby’s face. 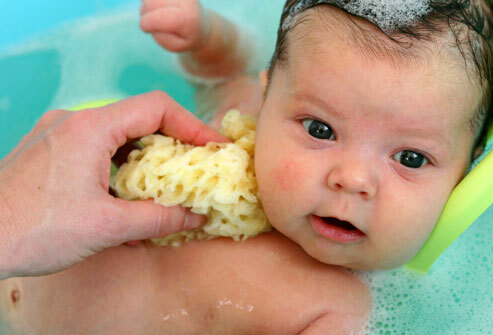 One of the reasons for this is because soap may irritate a newborn’s sensitive facial skin. Another is that a newborn’s skin is slightly acidic, which helps prevent infection. Soap can reduce the natural acidity of a newborn’s skin. The problem with not using soap on a baby’s face is that some of them will be more prone to newborn acne and other rashes because of dead skin, saliva and regurgitated milk that accumulates on their face. The answer to this problem is to wash the baby’s face with a ph-neutral soap substitute like Cetaphil Gentle Skin Cleanser. Using Cetaphil with a washcloth helps remove dead skin, etc. without harming the baby’s skin. This entry was posted in Dr. B's Blog and tagged newborn care, skin care. ← Why do kids have to be fever-free for 24 hours before returning to school?